It’s also important to understand which types of vehicles qualify for reimbursement in your area, since those parameters differ greatly from state to state. 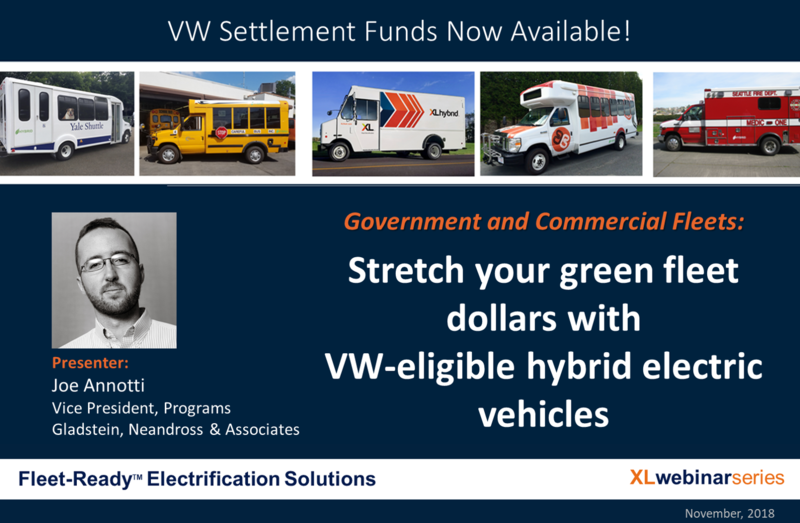 In 17 states right now, hybrid electric commercial vehicles – which can yield a 25% fuel economy improvement and 20% emissions reduction – are eligible for VW funding. Ford E-450 cutaways, Ford F-59s, and Chevrolet Express and GMC Savana 4500 cutaways are all examples of XL hybrid-equipped vehicles that can be used to replace the older diesel shuttle buses, step vans and delivery trucks you’re using now. To date, XL has prevented 13,000 tons of CO2 from entering the atmosphere, saved 1.5 million gallons of fuel for our customers and increased driver productivity by 10,000 hours… and counting. Our low price point (as compared to BEVs and alternative fuel systems) and demonstrable return on investment make our systems a no-brainer for the thousands of eligible fleets who drive these types of vehicles in urban environments with stop & go conditions. The VW program is emerging with new details all the time, so XL hosted a special webinar presentation to help you better understand what’s available and how to capitalize on it. Our expert guest presenter – Joe Annotti, vice president of programs at the leading clean energy consulting group, Gladstein, Neandross & Associates – dived into what those incentives look like, which vehicle types make the greatest impact in relative emissions reduction, and how to take advantage of those funding programs in your state. If you’re interested in VW funding opportunities, but don’t know where to begin, register and watch the webinar today and take your first step in learning more.